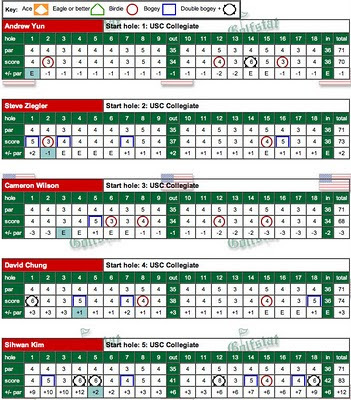 The Cardinal finishes 4th at the USC Invitational as summarized below led by the outstanding play of sophomore Andrew Yun. Next up will be a big tournament in Greensboro, NC at the end of March. The USC Invitational was Feb 28 and March 1 at North Ranch CC in Westlake Village, CA. Live scoring by GolfStat is available for the event that as usual has attracted a very strong field. Some background on the tournament can be found on USC's website. The 15-team field includes Arizona State, BYU, California, Cal State Northridge, Fresno State, Michigan, Oregon, Pepperdine, San Diego, San Diego State, Stanford, UC Davis, UCLA, USC and Washington. Stanford is represented by Andrew Yun, David Chung, Steve Ziegler, Cameron Wilson and Sihwan Kim and is hoping to bounce back from a disappointing tournament in Hawaii. 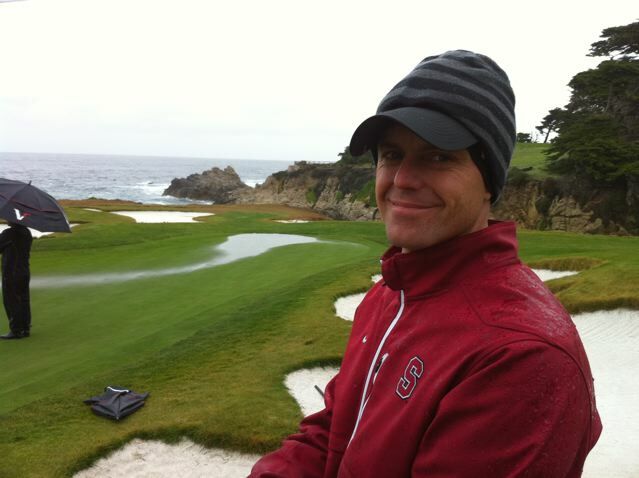 Stanford won this event in 2009 when Steve Ziegler was the low individual finisher. This link will take you to practice round videos provided by Coach Phil Rowe. I've included 2 out of the many videos of each Stanford player. 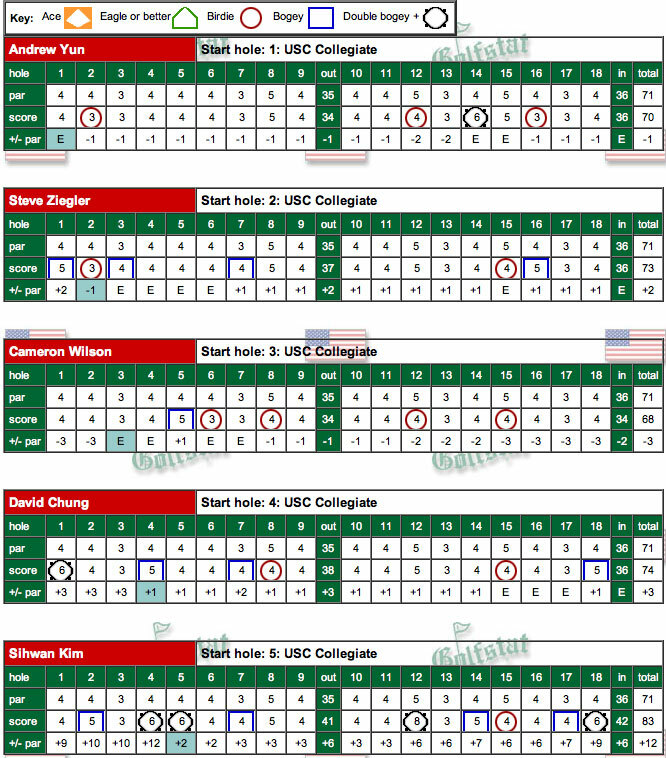 Stanford ends in 4th place behind San Diego State, UCLA and Oregon, finishing 13 shots behind. Andrew Yun led the way tying for 5th individually as he continued his strong play this season with steady rounds of 70-70-71. 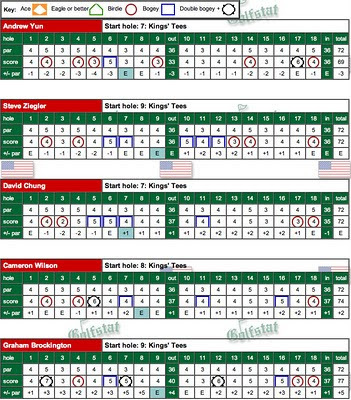 David Chung tied for 35th on rounds of 74-75-71, Cameron Wilson was tied for 44th after his 68-72-82, Steve Ziegler was tied for 51st shooting 73-80-72 and Sihwan Kim tied for 70th on rounds of 83-72-75. 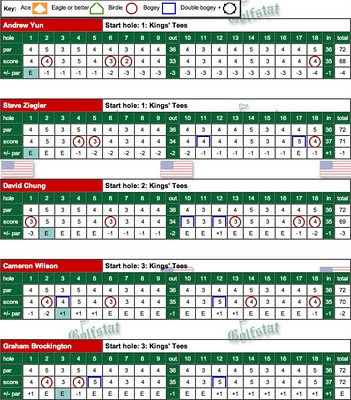 As shown by the scores, golf can be a very uneven challenge as demonstrated by Cameron's brilliant first round 68 with four birdies and 3 bogies contrasted with his third round 82 including 8 bogies and a double bogie with no birdies. Only Andrew Yun found a way to play steady golf throughout. After round one Stanford is in 6th place, but only 5 shots behind the leader UCLA. Freshman Cameron Wilson led the way with a 68, followed by Andrew Yun with 70, Steve Ziegler with 73, David Chung with 74 and Sihwan Kim's 83. 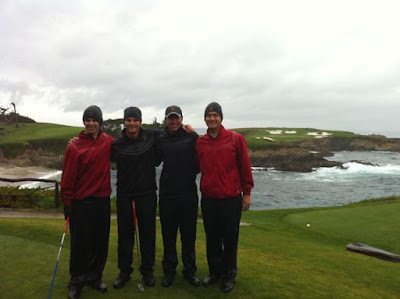 Here are a few photos provided by Coach Ray from the rainy day at Cypress Point in a match won by the Cardinal over USC 4.5-1.5. At the bottom are two videos provided by Coach Rowe - click on the videos to see higher quality views on You Tube. Results of each match can be found on the previous blog posting. PEBBLE BEACH, Calif. - Against one the most breathtaking settings in all of golf, Stanford's men's golf team downed USC, 4.5 to 1.5 in a match play event held at the Cypress Point Golf Club in Pebble Beach. To see more photos from Coach Ray go to the next blog posting. 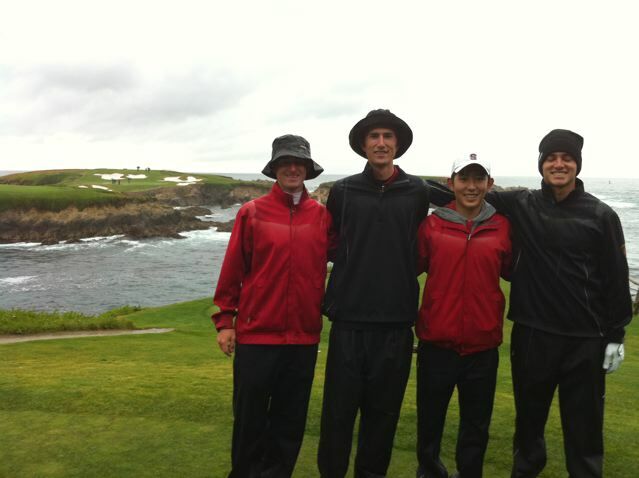 Steve Ziegler, Cameron Wilson, David Chung and Sihwan won their matches while Andrew Yun halved his. Stanford resumes its tournament schedule on Feb. 28 at the USC Invitational, held at the North Ranch Country Club in Westlake Village. Sihwan Kim beat Bo DeHuff 4&3. 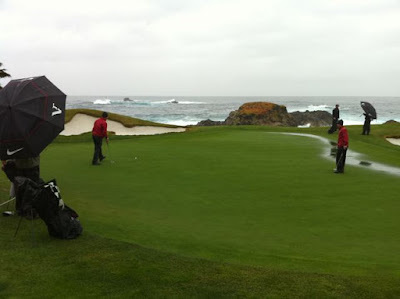 Here's a link to a video of Sihwan Kim's shot to 16 - http://www.youtube.com/watch?v=_2EputUC96U&feature=youtube_gdata_player. A final round 1-under 287 total left the Cardinal in 11th place in this tournament played at the Waikoloa Kings Course on the Big Island of Hawaii --- see tourney details below. The first round 293 total put the Cardinal 15 shots behind the eventual winner, Oklahoma State, and despite a solid 2nd round 278 the final round left Stanford 28 shots behind the OSU. Complete scoring by GolfStat.com can be found at http://golfstatresults.com/public/index.cfm?tournament_id=2445. The Cardinal was led by Andrew Yun's 75-68-69 that left him tied for 22nd. 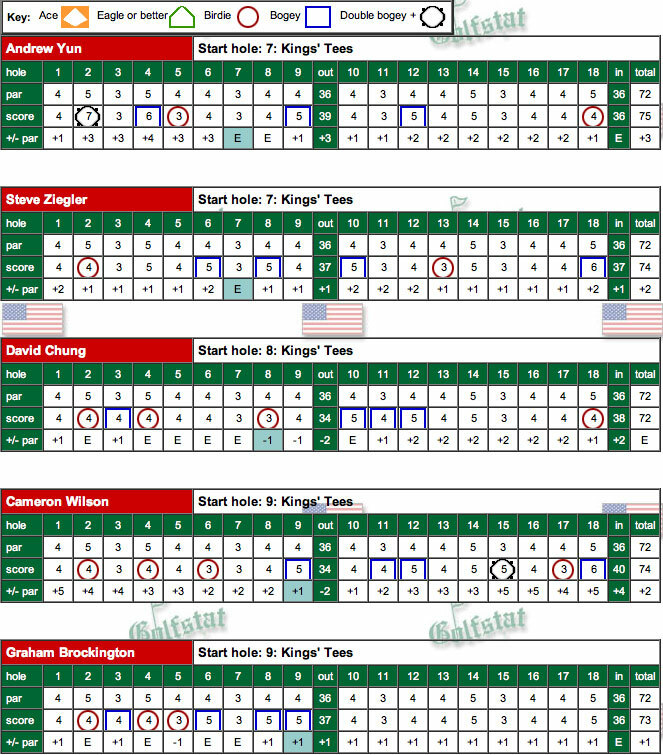 Next came David Chung with a 72-69-72 to tie for 28th, followed by Steve Ziegler with 74-71-72 tying for 51st, Cameron Wilson with 74-70-74 to tie for 59th and Graham Brockington's 73-72-77 tying for 80th. 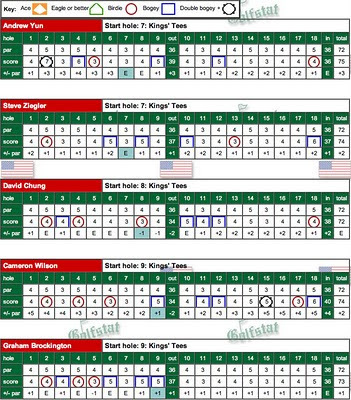 All in all a disappointing finish for the 11th ranked Cardinal who will have something to prove in the months ahead leading to the NCAA championship. 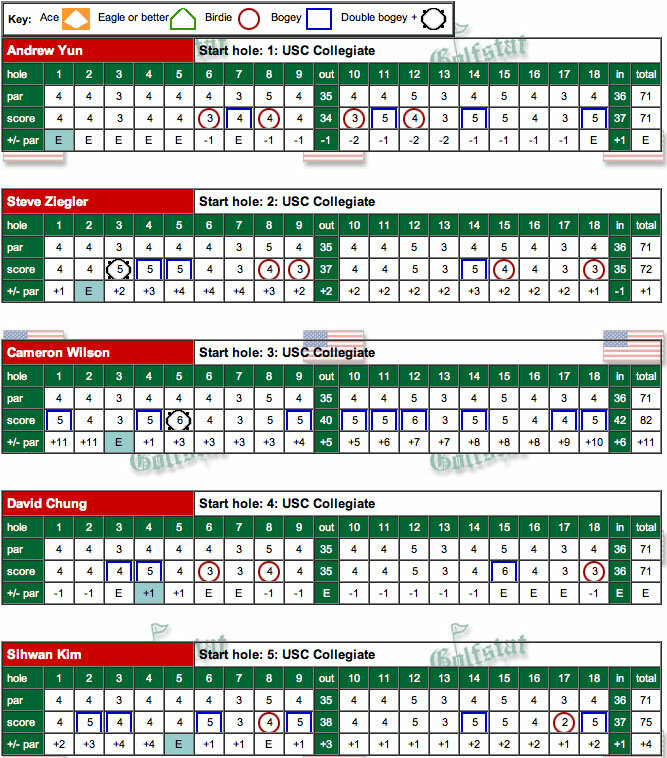 Final round scorecards are below --- click on image to enlarge. The Cardinal rebounded well after a poor first round with a 10-under par 278 total, 15 shots lower than round one's total leaving the team in 11th position, 20 shots behind OSU. Andrew Yun led the way with a 4-under 68 in a round that featured four birdies and no bogies. 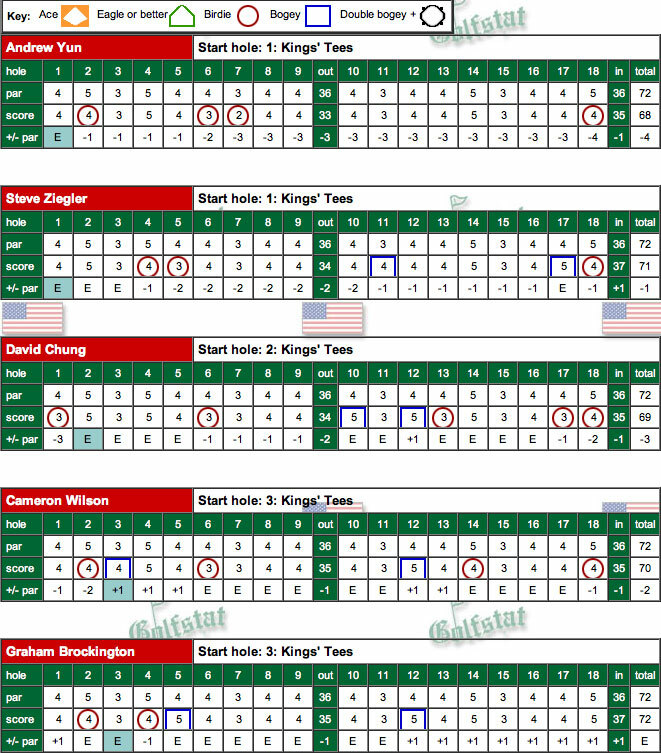 David Chung followed with a 69, Cameron Wilson shot 70, Steve Ziegler a 71 and Graham Brockington a 72. WAIKOLOA, Haw. - Thirteen teams managed to shoot under par on the first day of the Amer Ari Invitational being contested at the Kings' Course at Waikoloa on the Big Island on Wednesday. 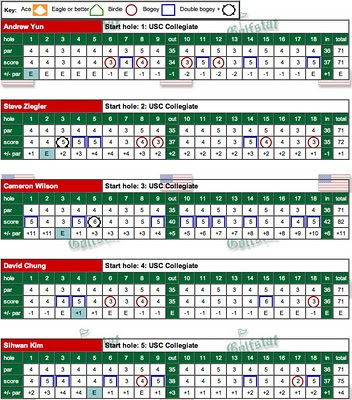 Unfortunately, Stanford was not included in the group that tamed the Kings' Course layout, as the Cardinal were five-over on its opening round and are in 19th place, 22 strokes behing first place USC. The Trojans shot a sizzling 17-under 271 and are seven strokes clear of Georgia Tech and Oklahoma State, who are tied for second at 278 (-10). 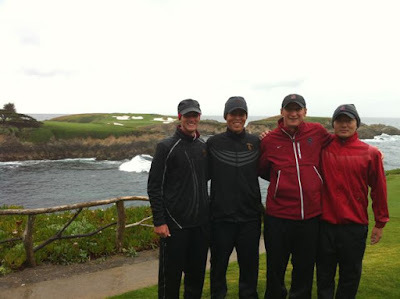 Arizona State is in fourth place at 279 (-9). Junior David Chung shot an even par 72 on his opening round and is tied for 42nd place on the leader board, 10 strokes behind Oregon's Daniel Miernicki, who shot an opening round 62. Miernicki has a four stroke cushion over San Jose State's Matt Hovan and USC's Jeffrey King and Sam Smith, who all carded rounds of 66 this morning. Senior Graham Brockington is tied for 65th place after an opening round 65. 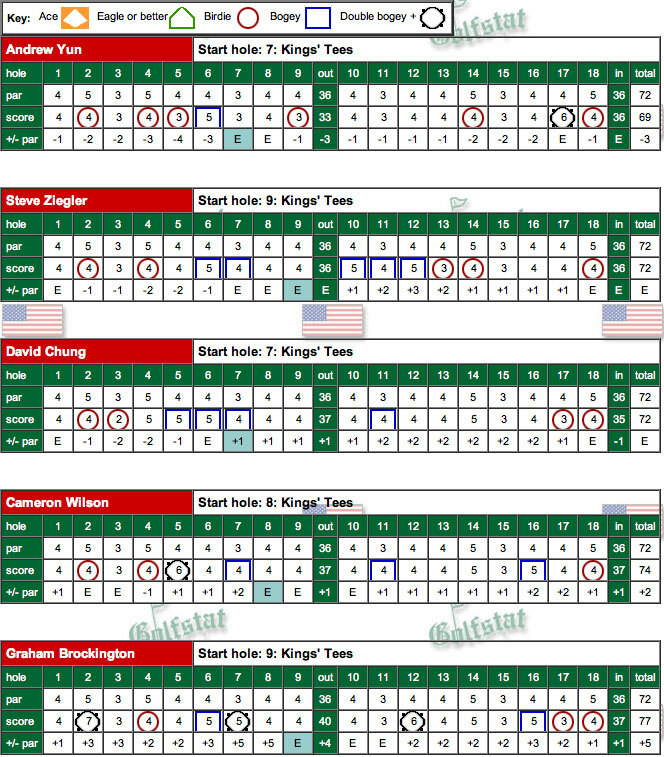 Brockington had three birdies and four bogies on the front nine and shot even par on the backside. Senior Steve Ziegler and freshman Cameron Wilson are tied for 76th after each shot two-over rounds of 72. Sophomore Andrew Yun is tied for 88th after an opening round 75. STANFORD, Calif. - Stanford's men's golf team, ranked 11th by Golfweek, will open its spring season on Wednesday at the Amer Ari Invitational, where the Cardinal will defend its team title against one of the strongest fields in the nation. 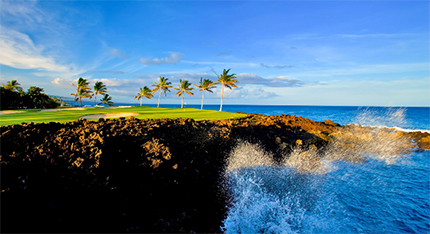 The 54-hole event gets underway Wednesday at the Waikoloa Kings' Course on the Big Island. Live scoring will be available on GolfStat.com -http://golfstatresults.com/public/index.cfm?tournament_id=2445. Top-ranked (Golfweek/Sagarin) UCLA, No. 2 Oklahoma State, No. 5 Georgia Tech and No. 7 Texas are also included in the field, along with Arizona State, Colorado, Florida State, Hawaii-Hilo, Hawaii-Manoa, Oregon, Oregon State, San Francisco, San Jose State, TCU, Texas Tech, Washington, Western Washington, USC and UC Davis. Stanford won last year's event with a 54-hole total of 866 on Mauna Lani's North Course, finishing three strokes ahead of Oregon and Washington for the team title. The Cardinal also captured team titles in 2007 and '08 in addition to last year's crown. Knowles Family Director of Golf Conrad Ray is expected to start a lineup featuring sophomoreAndrew Yun, senior Steve Ziegler, junior David Chung, freshman Cameron Wilson and seniorGraham Brockington. 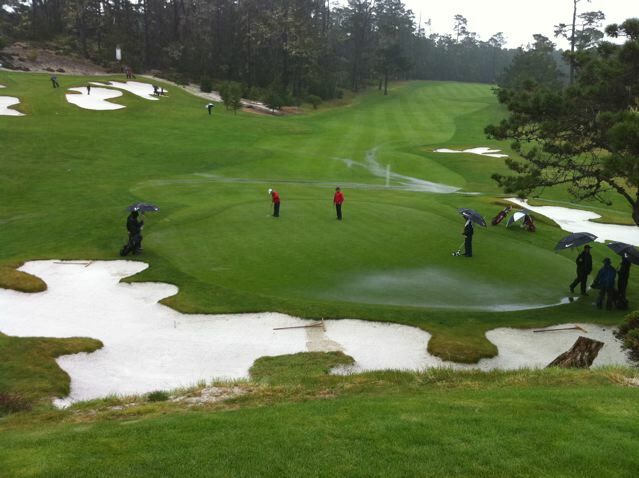 "It will be nice to be at close to full strength for the first tournament of the spring," said Ray. "It's probably the best field we will see this spring outside of the NCAA Championships and we've been lucky enough to fare pretty well over there the past couple of years. The Kings' Course is a great test of golf." Yun was Stanford's most consistent player in four fall events, carding two top-10 finishes highlighted by his first collegiate individual title at The Prestige. He also tied for fourth at the Isleworth Intercollegiate and narrowly missed a top-10 finish at the Fighting Illini Invitational at Olympia Field, where he tied for 11th. Ziegler, whose best finish in the fall was a tie for 14th at the Isleworth Collegiate, will hold down the No. 2 position in this event behind Yun after a strong qualifier. Chung, currently ranked second on the Royal & Ancient's World Amateur Golf Rankings, finished tied for ninth at the Gifford Collegiate in his only event of the fall. Wilson, one of two freshmen on this year's team along with Shane Lebow, was impressive in his four fall events, carding two top-10 finishes. In just his second collegiate event, the left-hander placed fifth at The Prestige at PGA West and closed the fall with a ninth place showing at the Gifford Collegiate. Brockington will make his first start of the season. "We have tremendous depth on this year's team," said Ray. "Five or six guys can win a tournament anytime out."